Iran has described allegations it is hiding a secret atomic warehouse as “an arts and crafts show” made up of photographs from Google Street View. The official response came after Israeli prime minister Benjamin Netanyahu told the UN General Assembly that nuclear equipment was being kept near a rug-cleaning business on the outskirts of Tehran. 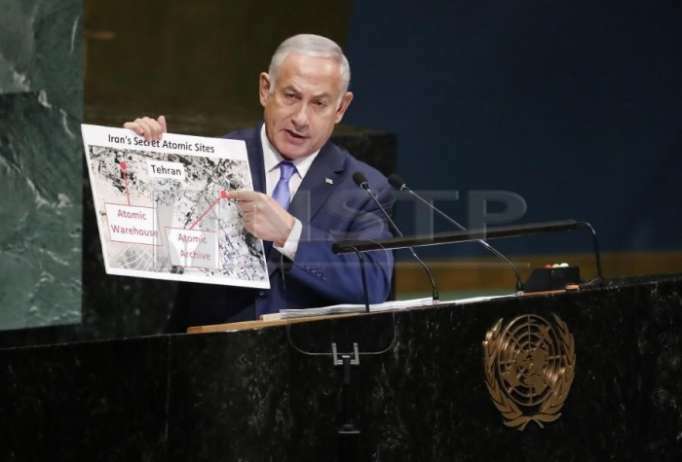 During his presentation to world leaders on Thursday, Mr Netanyahu held up a poster-board map of the area as he claimed Iranian officials had recently cleared out 15kg of material from the site and “spread it around”. Mr Netanyahu called on the International Atomic Energy Agency to inspect the site using Geiger counters and urged European countries to abandon the 2015 deal with Iran. “I am disclosing for the first time that Iran has another secret facility in Tehran, a secret atomic warehouse for storing massive amounts of equipment and materiel from Iran’s secret nuclear program,” he said. “No arts and craft show will ever obfuscate that Israel is only regime in our region with a *secret* and *undeclared* nuclear weapons program – including an *actual atomic arsenal*”, he tweeted. Mr Netanyahu also accused European leaders of “appeasing Iran” by helping it bypass new sanctions imposed by US president Donald Trump. “Does anyone seriously believe that flooding Iran’s theocracy with weapons and cash will curb its appetite for aggression?” Mr Netanyahu asked. Four months ago Israel announced that its intelligence officers had obtained a “half-ton” of Iranian nuclear documents in the Shourabad neighborhood near Tehran. Israel claimed the documents proved that Iran covered up its nuclear weapons program before signing the 2015 agreement, which loosened sanctions crippling the country’s economy. In 2012 Mr Netanyahu held up a cartoon picture of a bomb while discussing Iran’s nuclear program before saying ”a red line should be drawn right here” as he added a red line using a marker pen.